Six Cellulant employees killed in last week’s terror attack, were yesterday eulogised by family, colleagues and friends at an emotional memorial service in Nairobi. 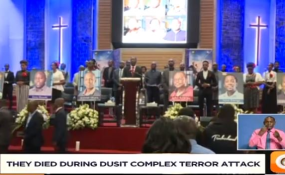 The funeral service at Christ is The Answer Ministry (Citam) Church, Valley Road, which was attended by over 800 mourners, was dominated by glowing tributes to the staff, who were among 21 others killed in the 14 Riverside Drive terrorist attack on January 15. The Citam service was presided over by Nairobi Chapel, Ngong Road senior pastor Nick Korir. Clergy from different denominations across the country also took part in the ceremony which trended on social media on the hashtag #CellulantBrave6. Cellulant Group chief executive officer Ken Njoroge praised the victims as dedicated staff who delivered in their respective departments. Mr Njoroge described the late Mwaniki, who joined the company in 2018, as the brains behind the firm’s data security. Mr Ndiritu and Mr Gitonga were working on a platform upgrade to increase customer numbers. “Despite all the darkness, the team has been supportive to the family emotionally and has been there for them,” said Mr Njoroge. The late Maina’s aunt Agnes Makumi recounted how she tried to reach her nephew several times when she heard of the attack with no success only to be told later that he lost his live. “This is a dark moment for the family as we have lost a friendly person who had a pure, unassuming and caring heart. He was to turn 36 on January 17,” she said. His colleague Alex Kimani, who had worked with him for the past 11 years, described him as a logical thinker and said that he had a premonition about the attack, having earlier discussed with another colleague what to do in case of a terrorist attack. Mr Mwaniki’s maternal uncle, Mr Peter Njagi, and his cousin Michael Mutugi eulogised him as a selfless person who put the happiness and lives of others before his. “He is survived by a wife a wife, Maria, whom he had just got married to five months ago,” said Mr Mutugi. The late Mbaria’s cousin Anthony Mwangi described him as the family’s anchor and one who was there for everyone. He left behind a wife of five years and a daughter. Ndiritu has left behind a daughter and was to celebrate his birthday today.